As early as 1883, Walcott, employee number 20 of the recently formed United States Geological Survey, was dispatched to the Grand Canyon by John Wesley Powell who, as the first Director of the Survey, was his boss. Powell had a more intimate experience of the rocks at the bottom of the Canyon than anyone, an experience that was probably too close for comfort. Anyway, Powell suspected that it was here, if anywhere, that would provide evidence for life in rocks that predated the Cambrian Period. 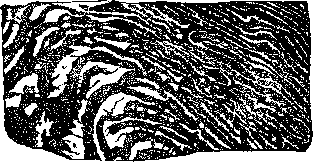 Drawing of a magnified section through Precambrian age Eozoon canadense which Dawson (1875) claimed to show organic structures such as protozoan pseudopodia and therefore represented the oldest known fossil at the time. For some 2$ years there had been a rumbling storm over the true nature of a fossil called Eozoon canadense (meaning 'dawn animal from Canada'). Claimed as the oldest and most primitive organism known, Eozoon was found in 1858 within ancient limestones exposed along the banks of the Ottawa River, west of Montreal in Canada. John William Dawson named it and portrayed it in 186$ as the remains of a giant unicellular organism. Dawson's reputation was so high that Eozoon was quickly accepted as a genuine fossil. Hailed by luminaries such as Thomas Henry Huxley, Eozoon was invoked as supporting evidence for Darwin's claim that there must have been a prolonged and almost unrecorded succession of primitive life forms in Precambrian rocks. As Huxley wrote in 1870, 'it is appalling to speculate upon the extent to which that origin must have preceded the epoch of the first recorded appearance of vertebrate life'. Dawson was not pleased to have Huxley's support. A Calvinist, Dawson did not subscribe to Darwin's theory of evolution and considered rather that Eozoon demonstrated that there is no link whatever in the geological fact to connect Eozoon with the Mollusks, Radiates, or crustaceans of the succeeding [Cambrian strata] ... these stand before us as distinct creations. An unreconstructed section through Eozoon canadense does show organic-like structures but they were subsequently shown to be inorganic mineral growths. However, there were some dissenting voices who doubted that Eozoon was a unicelled organism and yet others who doubted that it was genuinely organic. Even within a year of publication, Irish-based palaeontologist William King was on the attack. Just from Dawson's illustration, King observed that it was no more than an inorganic structure resulting from metamorphism of carbonate minerals in the limestone. Nevertheless, Dawson refused to acknowledge any doubts and defended his fossil into his old age. In 1894, just a few years before his death, Eozoon-\\ke, structures were found in a limestone block ejected during an eruption of Mount Vesuvius. As King had predicted, extreme heat within the volcano had indeed caused chemical changes of the carbonate minerals to produce Eozoon. William King, 1809-86, British palaeontologist and expert on Permian fossils, was Lyell's assistant then became professor of geology at Queen's College, Galway in Ireland (from 1849), named the extinct human-related species Homo neanderthalensis in 1863. By the 1880s increasing numbers of experts had come to doubt the organic nature of Dawson's Eozoon. And since no new convincing fossils had turned up in Precambrian strata anywhere else in the world, they had virtually given up looking for them. Powell, presumably, still held out some hope and probably knew that if anyone could find them it would be Walcott despite his lack of any formal university training in palaeontology. However, Walcott had been very well brought up in fossiliferous matters by the redoubtable and famously irascible chief geologist of New York State, James Hall. Walcott had been Hall's assistant and had closely examined some very primitive-looking organic structures that Hall had found in Cambrian (Sedgwick's Cambrian had been largely reinstated by this time) limestones of Saratoga in the east of Hall's home state. James Hall, 1811-98, palaeontologist and chief geologist of the New York State Survey (1836-98), first director of New York State Museum (from 1871). These strange, cauliflower-like mounded structures were distinctly layered and Hall was to formally name them Cryptozoon (meaning 'hidden life') in 1883, but he was not able to find any definitive structures such as identifiable cell spaces that would clinch their fundamental organic nature. 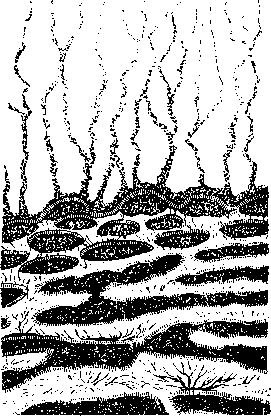 Nevertheless, Hall strongly suspected that laminated and aptly named Cryptozoon mounds were small, reef-like structures made by algal communities. Having examined the evidence himself, Walcott was also convinced of their true organic nature. Not long after Walcott arrived in the Canyon, he was able to report that he had found structures similar to but significantly older than Hall's Cambrian ones. It was Walcott who first recognised that the ancient sediments, which Powell had designated as 'Algonkian' in age (an old North American name for the Precambrian), could be divided into what he called the Unkar and Chuar 'terranes'. Where exactly Walcott first found laminated mound structures (now known as stromatolites) in the Chuar strata is not clear, but it was probably high up the succession in the Awatubi Member strata where they are particularly well developed and readily visible - if you know what you are looking for, and Walcott did. Here, the mounds form columns 5-7 cm (2-3 in) wide and they grew into closely packed, pipe-like forms 2.5-3 m (8-10 ft) high. Sir Albert Charles Seward, 1863-1941, professor of botany at Cambridge and author of an influential textbook, Plant Life through the Ages (1931), knighted 1936.
scepticism of the biological community, epitomised by an eminent Cambridge (England) botanist, Albert C. Seward. The general belief among American geologists and several European authors in the organic origin of Cryptozoon is, I venture to think, not justified by the facts ... [such forms] are precisely the same in their series of concentric shells as many concretions which are universally assigned to purely inorganic agencies ... [furthermore] it is clearly impossible to maintain that all such concentrically constructed bodies are even in part attributable to algal activity. primitive algae may have flourished in Pre-Cambrian seas and inland lakes; but to regard these hypothetical plants as creators of reefs of Cryptozoon and allied structures is to make a demand upon imagination inconsistent with Wordsworth's definition of that quality as 'reason in its most exalted mood'. these and similar contributions ... are by no means convincing ... we can hardly expect to find in Pre-Cambrian rocks any actual proof of the existence of bacteria. But in science, as in many other aspects of life, never say never. Seward turned out to be spectacularly wrong. Over subsequent decades similar mound structures were found in Precambrian strata all over the world, but still not until the 1950s was there any great development in our understanding of them or biologically convincing evidence for the existence of life in Precambrian. The critical fossils were not found in the Canyon but in Canadian Precambrian strata of the Lake Superior region. In 1953 Stanley Tyler, a well-known American economic geologist, was investigating some curious iron-rich Precambrian strata known as the Gunflint Formation. Stanley Tyler, 1906-63, American economic geologist at the University of Wisconsin and discoverer of the Precambrian Gunflint Chert and its microfossils. These banded iron-rich formation (BIF) strata form economically important iron ores, but remarkably little was known about how they formed or the extent of the deposits. We now know that similar, globally distributed deposits are telling us something very important about the chemistry of ancient oceans and atmospheres. They record low but slowly rising oxygen levels in the primitive atmosphere and ocean water. A change in the iron mineral composition of the BIF, around 2.2 billion years with the formation of red iron oxides, signals a threshold in rising oxygen levels, perhaps to around 15 per cent of its present level. Importantly, this meant that life forms dependent on oxygen could at last begin to thrive. Very few of the organisms we are familiar with today would have lasted very long in the oceans or atmosphere of the Earth prior to 2.2 billion years ago. Tyler traced the strata from the ironworks of the Mesabi Range in Minnesota along the western shore of Lake Superior for some 500 km. Taking a day off to go fishing, he took his boat around Flint Island near the village of Schreiber, Ontario. Noticing some gently sloping strata by the water's edge, he could not resist taking a look and found that it was a black layer of chert instead of the more usual red iron-rich cherts and other sediments. Breaking some off with his hammer, Tyler was impressed by the shiny, almost coaly appearance of the chert. It was this deposit that had given the island its name, for chert is the same as flint and has been used for hundreds of thousands of years by our ancient ancestors for stone tools and weapons and in historical times as a source of gunflints for flint-lock weapons. Although the rock is sedimentary in origin, it has a hard, brittle, glassy toughness and sharpness when flaked. Made of silica, the deposits form in a similar way to carbonate nodules within wet sea and lake-bed sediments. The silica may be derived from a number of sources, but is chemically unstable in most sedimentary environments and so precipitates in irregular-shaped nodules and layers, quickly hardening into virtually incompressible and indestructible rock material. Any organic material within them can be preserved in remarkable detail without compression. Tyler saw that the unusual Flint Island cherts were full of the enigmatic Cryptozoon laminated mounds, some up to a metre in diameter. Although he was mostly interested in the red beds, he collected samples of the black chert that were duly sliced into thin sections back in his laboratory at the University of Wisconsin. Whether Tyler caught any fish on that memorable day is not recorded but, although he did not know it at the time, he had landed one of the most important catches in the history of palaeontology. Examination of the slides soon showed why the cherts were black. They were full of cloudy clumps and wisps of microscopic particles of brown to black material that looked remarkably organic in nature. Being an economic geologist, Tyler was well used to all the strange, organic-looking structures that some inorganic minerals can mimic. He knew that these were not any of the usual iron sulphide or oxide minerals such as pyrite or magnetite. They looked like organic cells and filaments. He also realised that the rock had not been metamorphosed in the way that other parts of the Precambrian red-bed strata are. There was absolutely no doubt about their Precambrian age; indeed, they were generally regarded as mid-Precambrian and we now know that they are an astonishing 1.9 billion years old and thus older than any of the rocks in the Grand Canyon. However, with no biological training, Tyler did not feel confident enough simply to pronounce them as definite Precambrian fossils. After all, could they be some younger contaminants of the rock? Eventually, in 1953 Tyler plucked up courage to show pictures of his chert slides to Robert Shrock, an eminent palaeontologist, who enthusiastically directed Tyler to one person who really knew about plants and fossils, a young palaeobotanist called Elso Barghoorn. Robert Rakes Shrock, 1905-93, American palaeontologist, graduate of Indiana University who taught geology at Wisconsin (1928-37) and MIT (1937-75), where he helped develop oceanographic science and co-authored the influential textbooks Sequence in Layered Rocks and Principles of Invertebrate Paleontology (with W. H. Twenhofel). Barghoorn, as a specialist in fungae, had spent part of his Second World War service investigating fungal contamination of military equipment. Consequently, he knew a thing or two about fungae and was sufficiently impressed by Tyler's photos to realise that they had to publish some results quickly in case somebody else was working on similar material and beat them to it. Priority in publication counts in the scientific race; as in athletics, there is not much credit in being second. Elso Barghoorn, 1915-84, American palaeobotanist of Finnish extraction who studied at Miami University, Ohio and Harvard (1941). Following military service in the Second World War, he taught at Amherst College and then became professor at Harvard. (April 30th, 1954), one of the premier international scientific journals, found in any decent university library in the world. 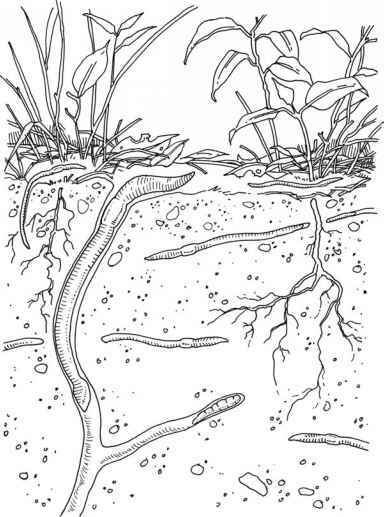 The Precambrian 'can of worms' was definitely open and it was clear beyond any doubt that layered Cryptozoon mounds had an organic basis, but exactly what organism had generated them?